Axis Technolabs is Trusted iPhone application Development Company India and USA since 2008. iPhone is one of the most popular mobile devices among the consumers all over the world. We understand the today's client's demands for interesting in Custom iPhone App Development. iPhone application proves successor to the consumers assuring great return on investment for the native iPhone app. Hire Dedicated iPhone app developers or swift developers for turning your business needs into mobile app reality. 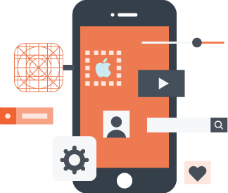 Our experienced iPhone app developers have hands-on experience in planning, building and deploying complex applications successfully. Why should Axis Technolabs as Your iPhone App Development Partner? Steve Jobs reminded everyone that great design is not about how it looks, but how it works! Axis Technolabs approaches the same. Our team of iPhone developers and experts has a very consultative approach when it comes to engaging with customers. At any point during the engagement, our iPhone developers or managers are only an iPhone away to address your needs. The idea behind developing games for the iOS platform is to strongly captivate the awareness of the audience. Usage of iPhone app UI/UX designing and frameworks of Native iPhone application development services. Your idea is already bright, but by the time it goes through our custom 3 Tiered app development process and reaches the App Store, it'll like a Marvel! Here's how we will make your app idea Bulletproof. It's our Strategy, design, Development. What do you get from Axistechnolabs Team ? IPhone App Developers work closely with our clients to understand their each and every requirement and deliver good solutions to suit their business needs. Designing a wide range of iPhone apps, we are proficient in iPhone app development to enrich demands of the clients. Our work process is quality oriented that assures you best return on your investment and outstanding outcome for your iPhone app idea. We keep updated features and market Course. We are also updating existing iphone apps to ios 9 with swift language. We are developing IOS app in following Industries..